I have three machines by Ludwig Spitz. 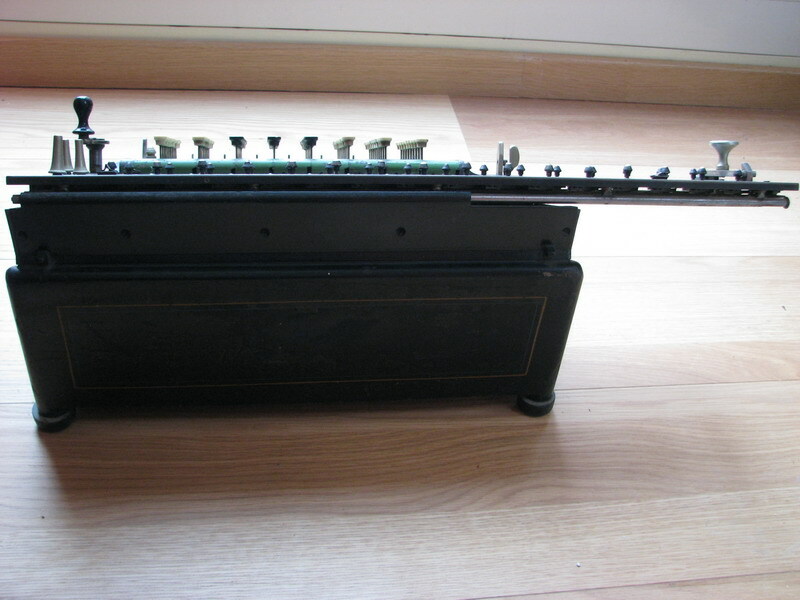 The first one is the TIM III slider model, right after wooden cases or machines from wooden cases with metal feet were abandoned, and the TIM machine received its very characteristic look, which was to stay with it throughout its history. 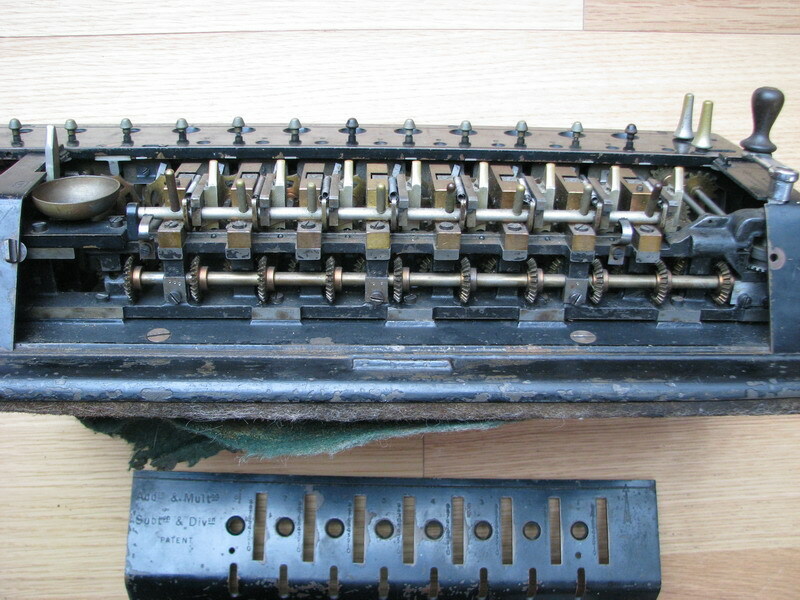 The serial number is, I think, N° 2561, but many of the parts also have four digit part numbers, which always have a preceding zero, so some confusion is not out of the question. 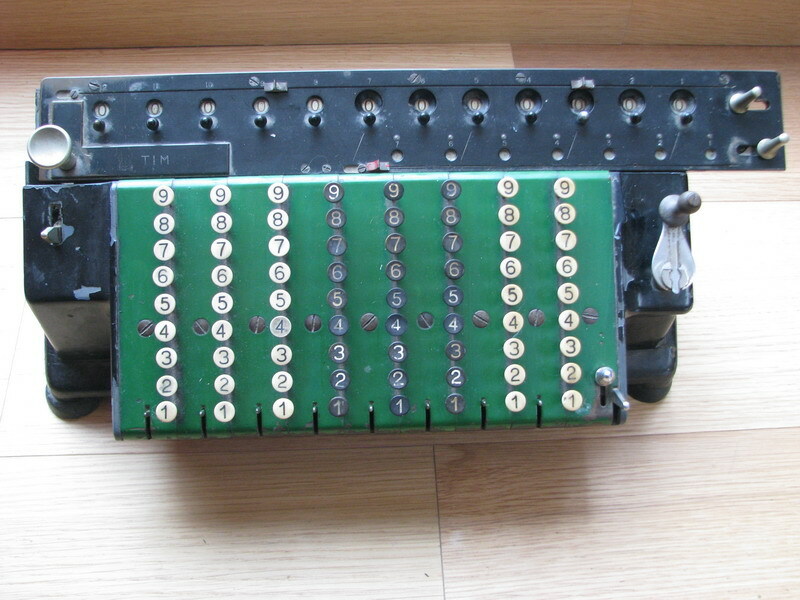 This particular machine was part of the calculator fleet of the "Prudential Assurance Company Ltd.", with inventory number 81. I can only assume that this would be the London based company, and not the Prudential Insurance Company of America. 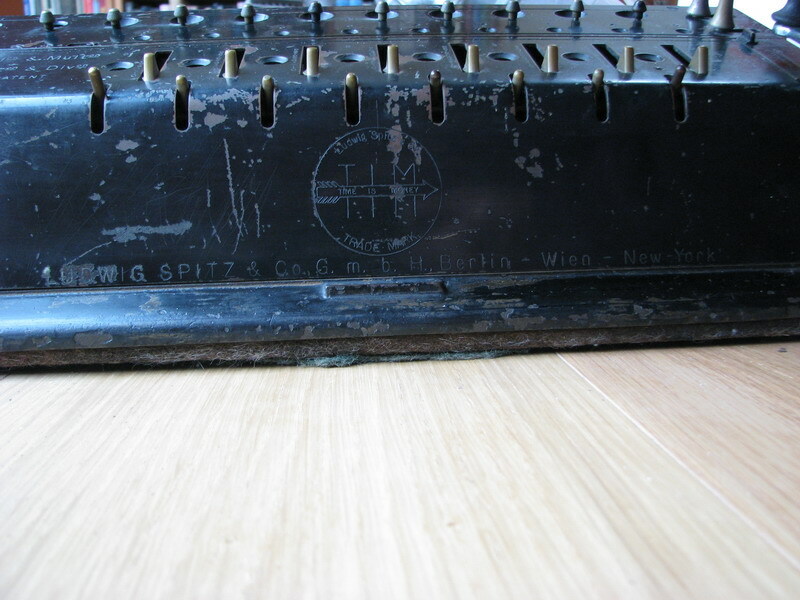 However happy Ludwig Spitz was to advertise his machines as hailing from Berlin, Vienna and New York, this specimen never seems to have made it further than London. As a design though, it is brilliant. The handle is still fixed to the machine. See below for more on that. 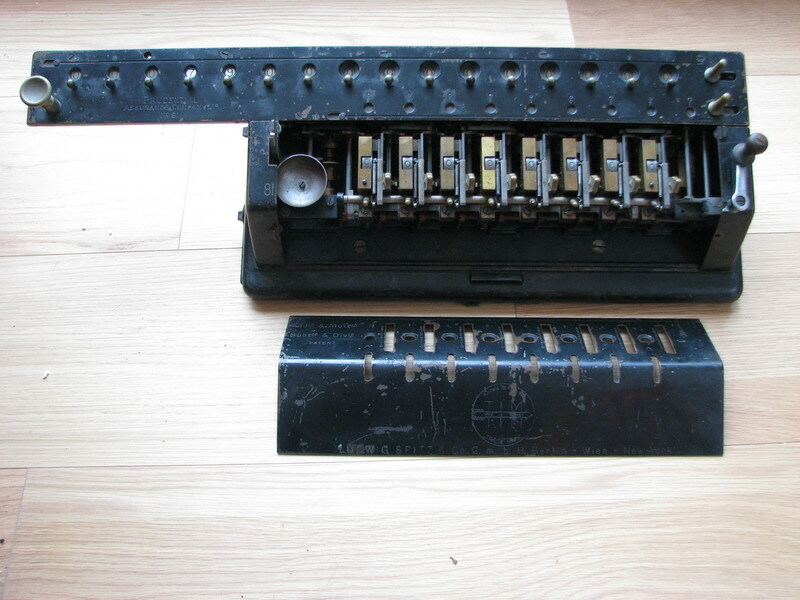 The TIM machines have a very short input keyboard, which operates along a patented principle (possibly patent nr. 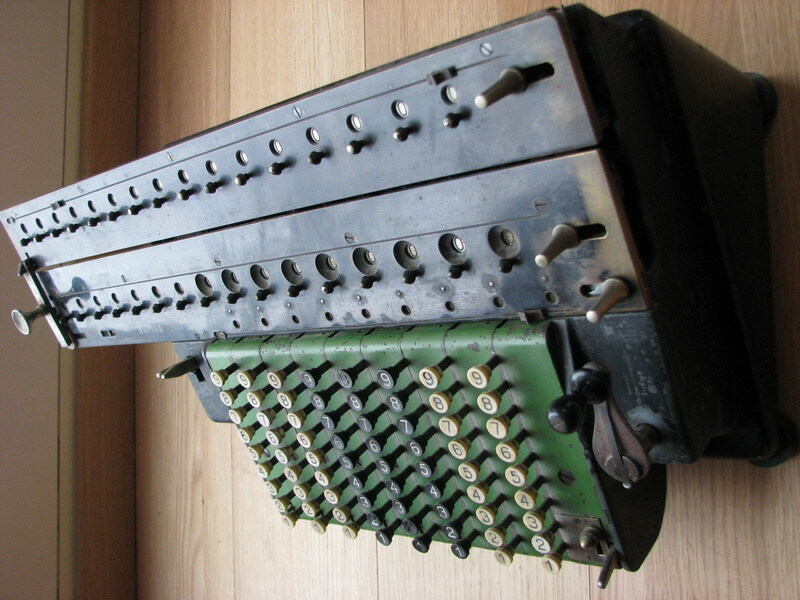 AT36747 - Spitz, his engineer Robert Rein and other collborators took out over 30 patents between 1906 and 1932). 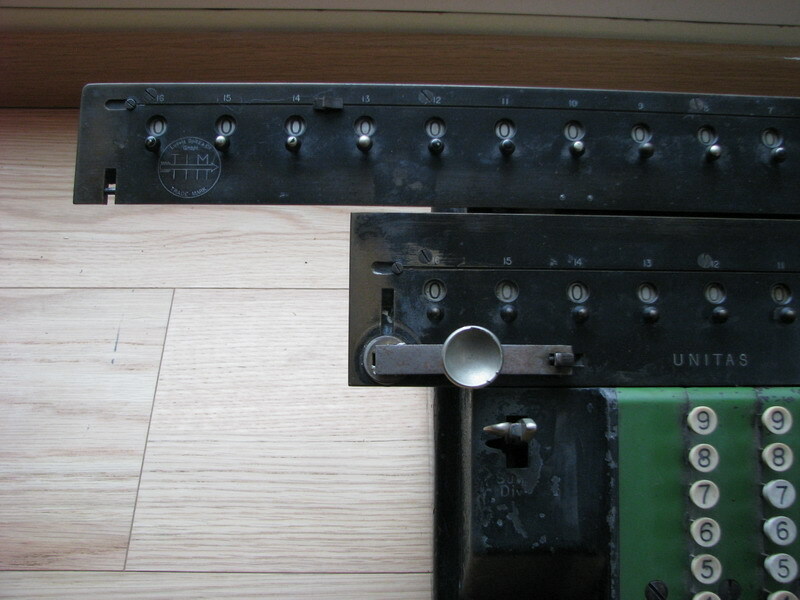 So proud must Ludwig Spitz have been of this particular idea, that he made the input cover easily removable without tools - there are four catches on the corners which allow the panel to be lifted out in a few seconds, to make the mechanism accessible to the curious user. 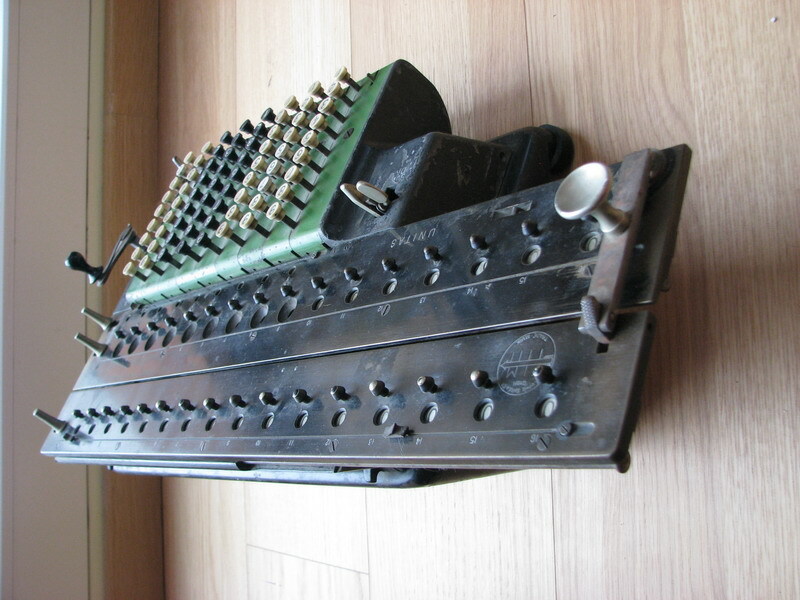 Other improvements include the register clearing (with specially shaped clearing levers that might/would provide fractional improvement in operating speed, apart from being a signature design of the TIM), the interesting comma sliders (here missing, but see the machines below), and the very light and easy to operate spring-loaded mechanism for resetting the input sliders, here only still individually, and not all together. 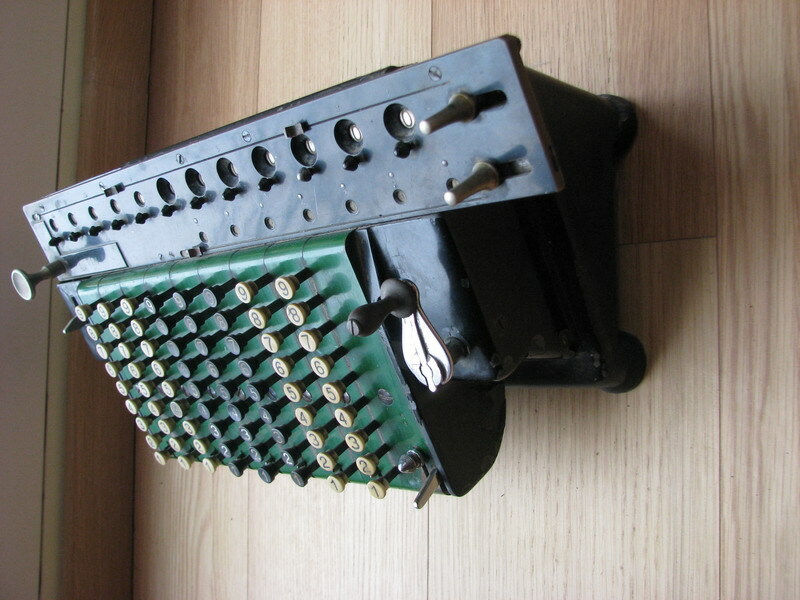 The next machine is TIM II N° 9997. 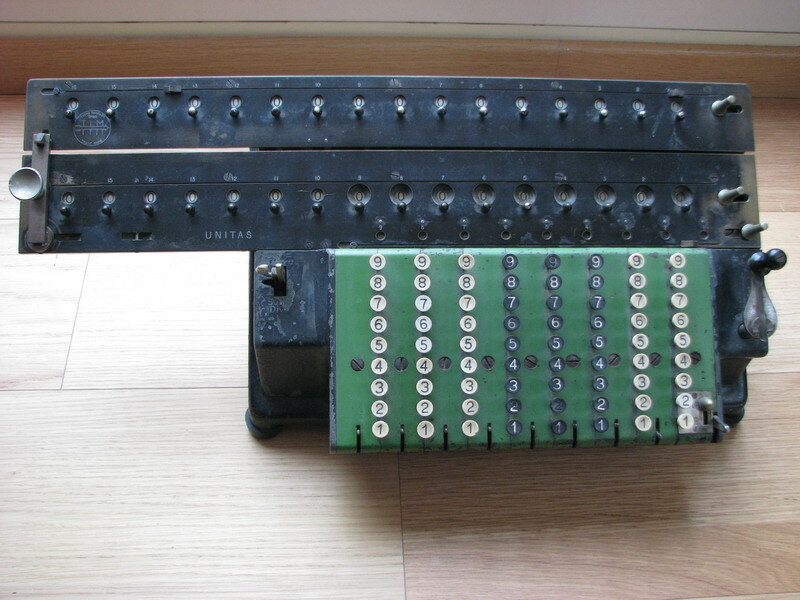 At the brink of having made 10000 machines, this one, with keyboard grafted on, is technically still very similar to the one above. 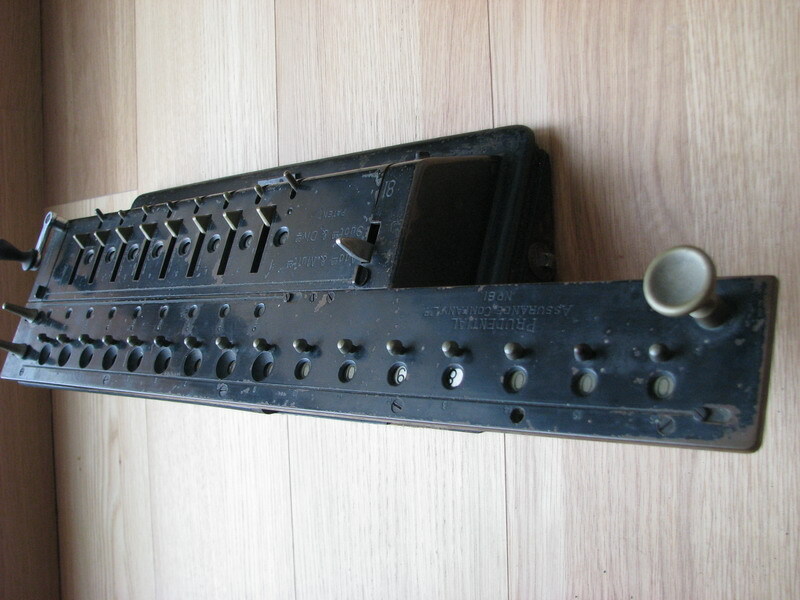 This machine introduces further innovations - each keyboard row is an individual piece, with its own cover. 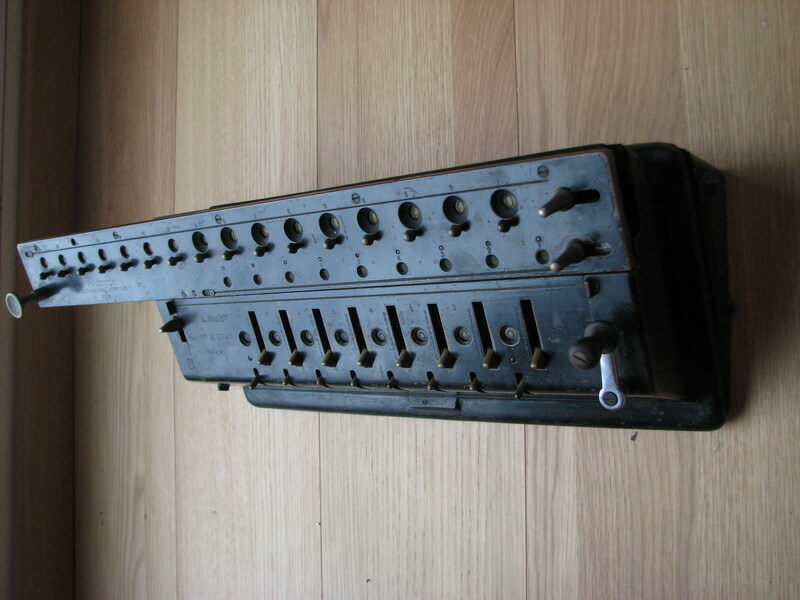 This allowed Spitz to manufacture machines which were modular - a new capacity was very easily introduced. 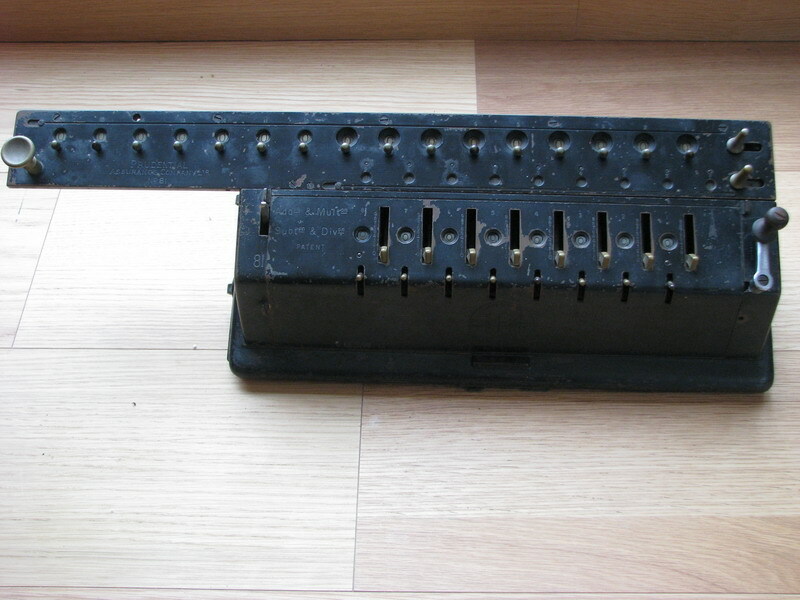 Another manufacturer would have had to make a new keyboard top plate, but due to the modular design, Spitz had less parts to redesign. 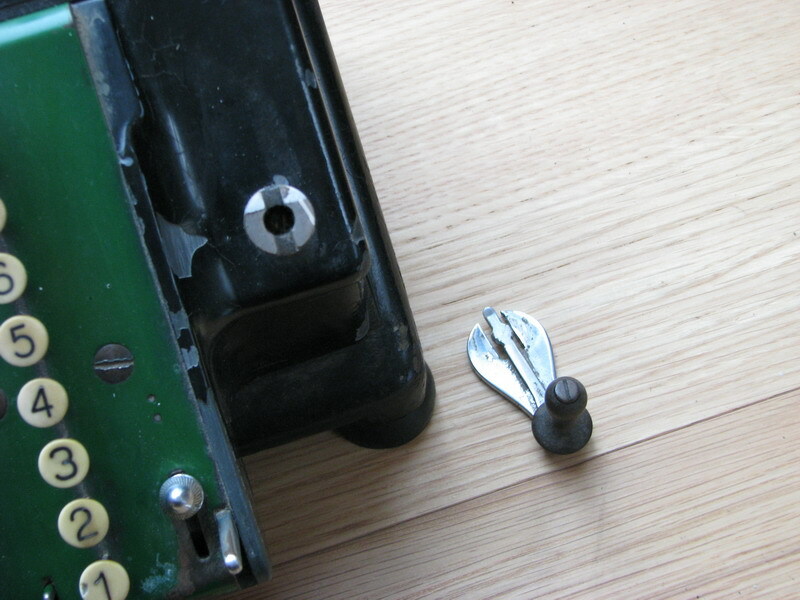 There is now also a common clearing knob for the input register, and a setting which clears the register after every turn of the crank, so the machine is easily used as a non-printing adding machine. The crank has become removable in what would also be a signature feature of the TIM machines. 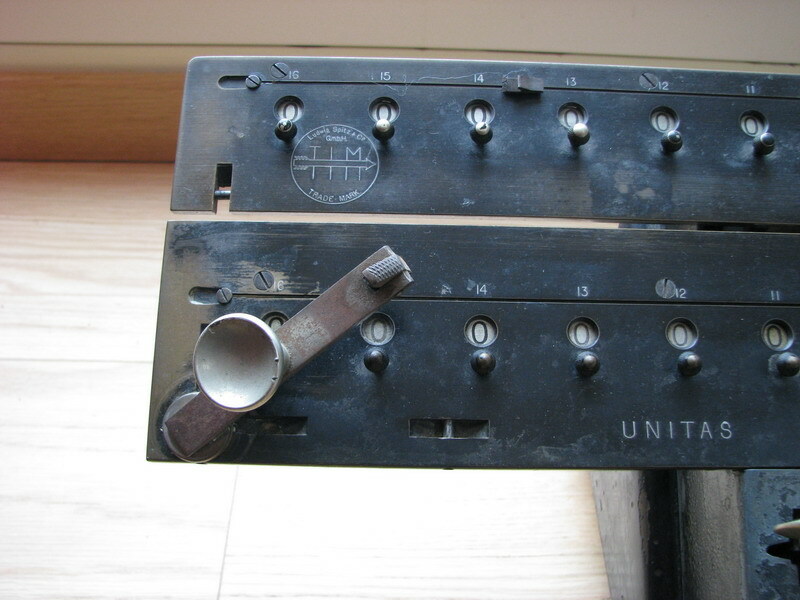 Why exactly this was deemed necessary is a good question- you can work with the machine just by turning the stub if need be, and of course a consequence, now almost a century later, is that many TIM machines come without the crank, as it has been lost over the years. Another oddity of this machine is the signature green paint, which is here suspiciously darker than usual. I have seen other machines with darker green paint, but here it still leads me to believe that this particular specimen has been repainted later, with whatever green paint they could find. 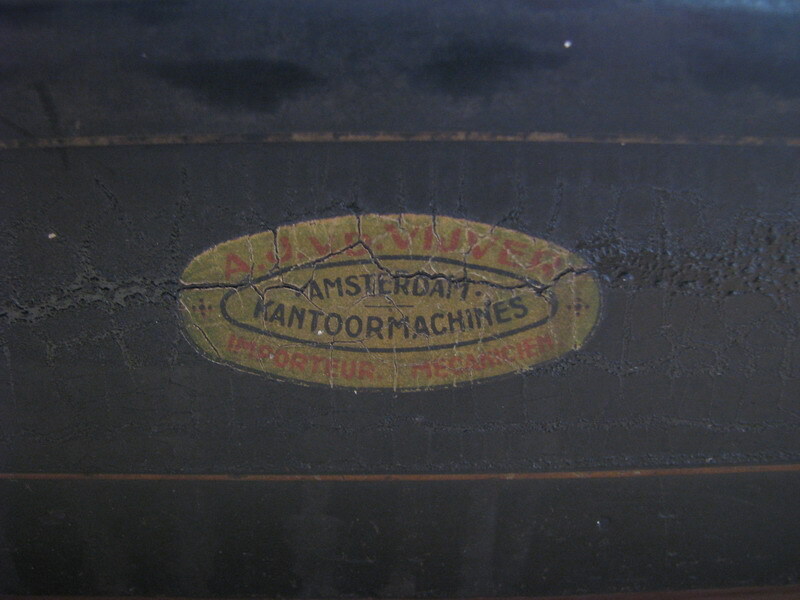 Of the Dutch office machines importer (and "mechanic") in Amsterdam mentioned on the back (without address), I cannot find a trace. 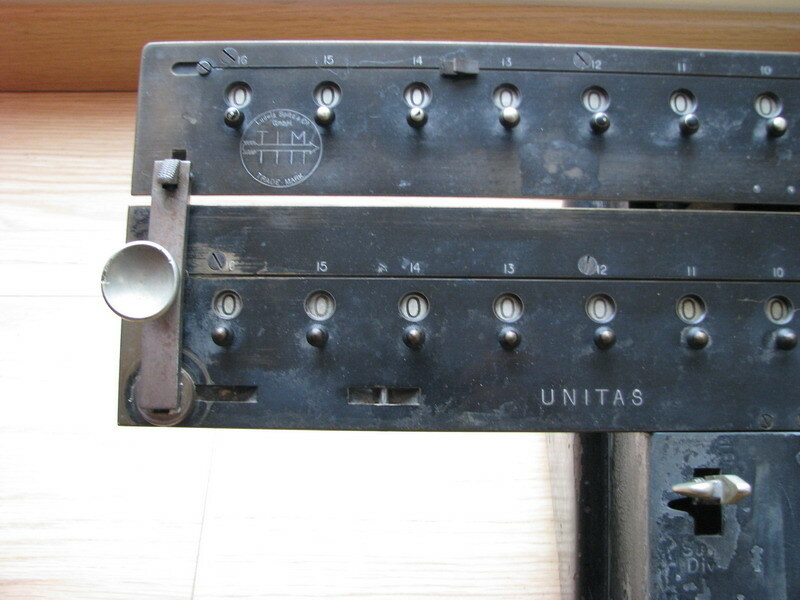 And finally there is the UNITAS Model III machine with N° 8463, and of course, being a UNITAS, two carriages. 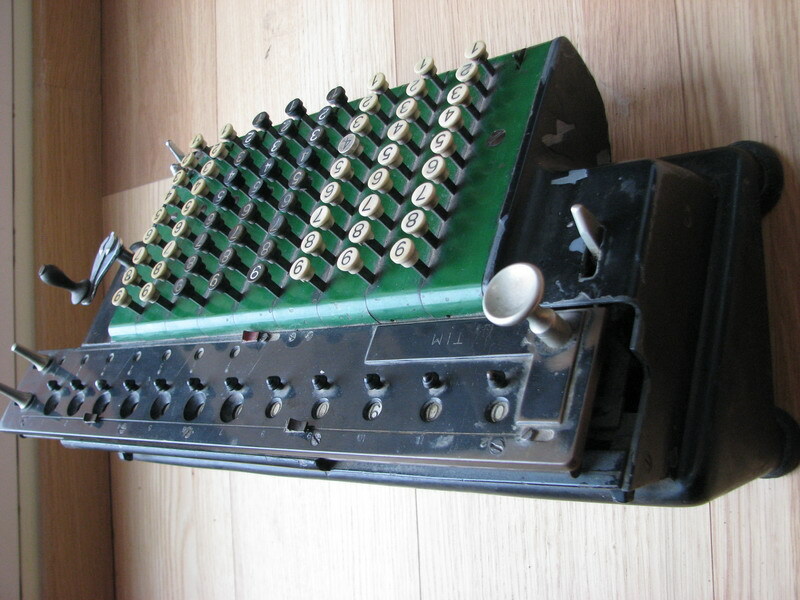 An obvious use is the calculation of partial sums, together with the grand total. 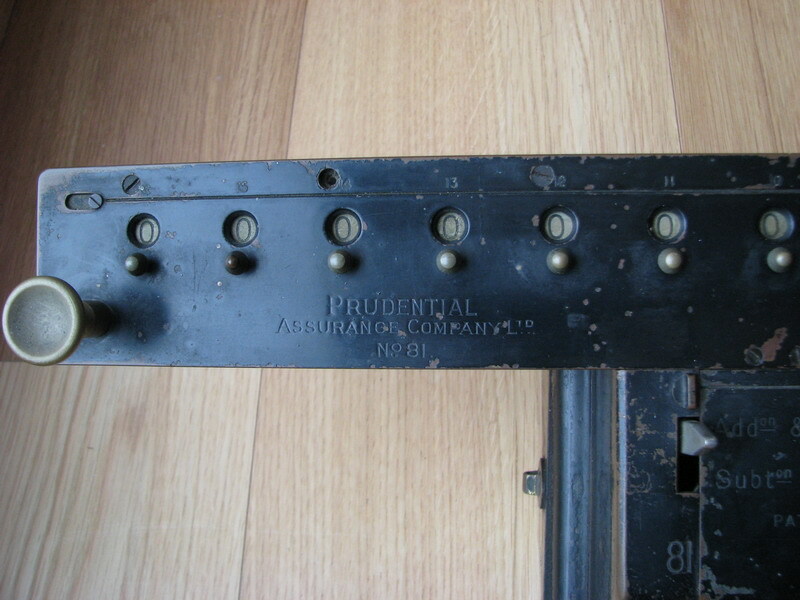 Additional complications with respect to the regular, one-register TIM are the direction lever, which is now doubled, in order to allow the top carriage to count in the opposite direction as the bottom carriage. 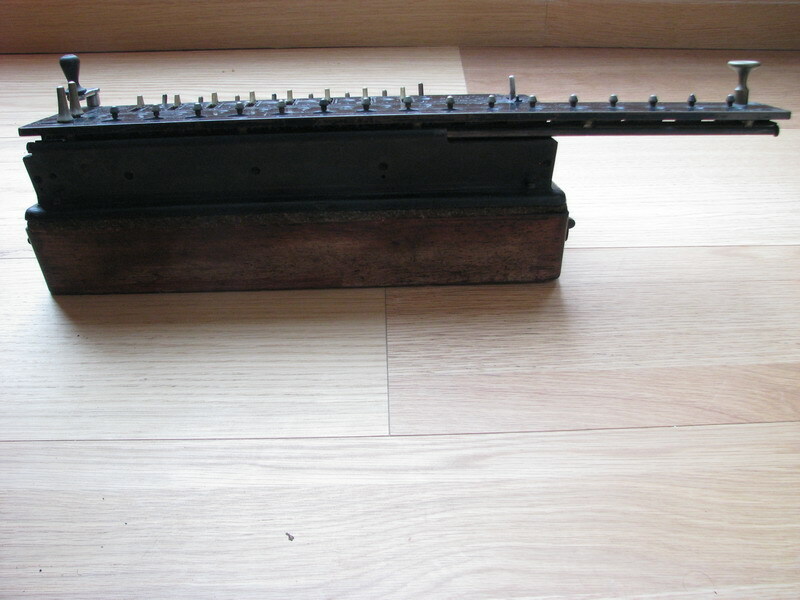 In typical Spitz fashion, you don't just set the direction of the bottom carriage with one lever, and the direction of the top carriage with another, no, there is a special kind of interlock, which moves both levers together, unless you compress them, which then allows to detach the lever for the top carriage and rest it towards the left in the middle of its travel. When this is done, the top carriage does the opposite of whatever the bottom carriage is doing. Why? This feature is very handy for proving divisions (you will get the dividend back in the top carriage after finishing the operation). Another use would be percentual discounts - you can calculate the amount of the discount, and at the same time subtract it from the gross amount. The carriages can be lifted and shifted together due to an ingenious coupling system, that also allows to leave the top carriage stationary as the bottom carrage is moved. Ludwig Spitz has thoughtfully provided a catch on the bottom carriage, which allows the knob for moving the bottom carriage to snap into place, so you will have an enjoyable calculating experience whatever your choice of carriage(s) to move. 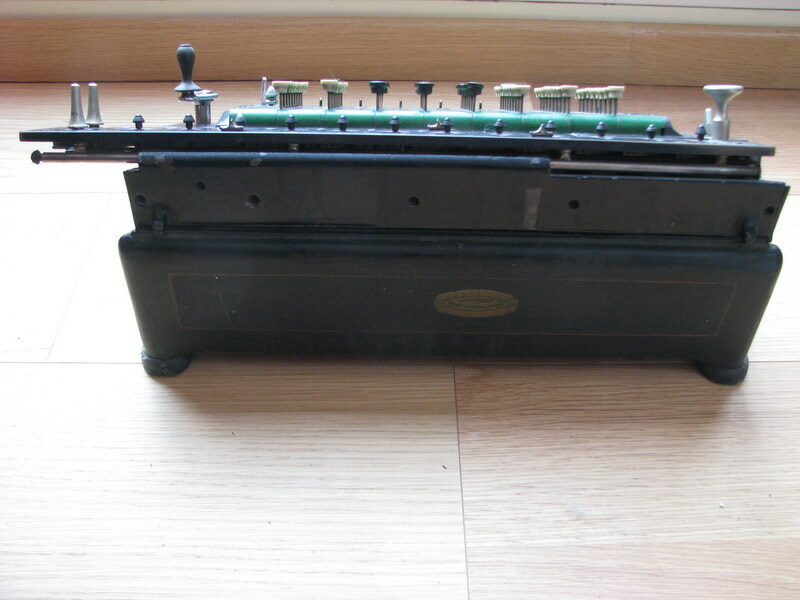 These are very enjoyable machines to work with, but I find that the carriages, and especially the tens' carry mechanism, tend to get quite stiff with age, needing a full disassembly and cleaning before they work properly. 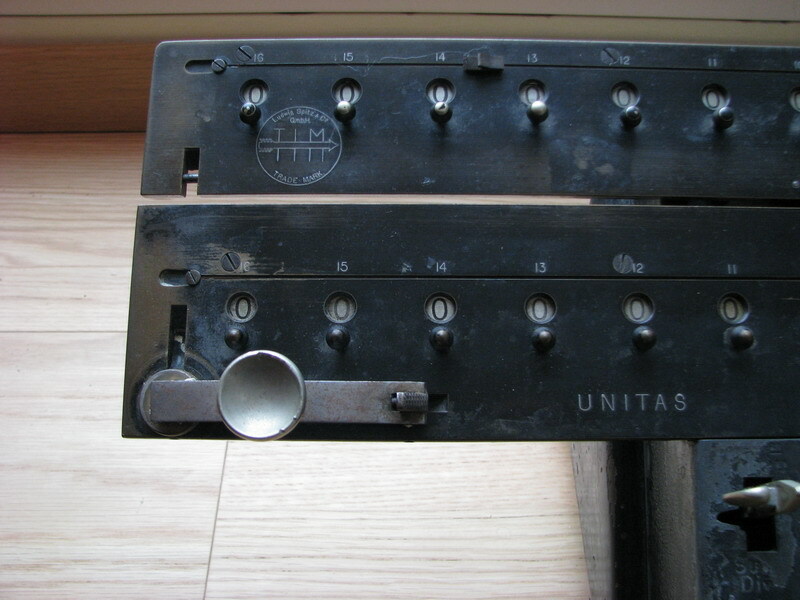 Manuals for the TIM and Unitas can be found on the TIM and Unitas site. On the front of the manual is proudly printed a picture of the factory, at the Eresburgstrasse 22-23 in Berlin. And sure enough, this building, which was put there as a landmark of innovation and invention in the mechanical area, is back at the forefront of innovation today, but in the biomedical industry, being the synthetic headquarters of TIB MOLBIOL. And it is still a beautiful building, even though the trees have grown somewhat.